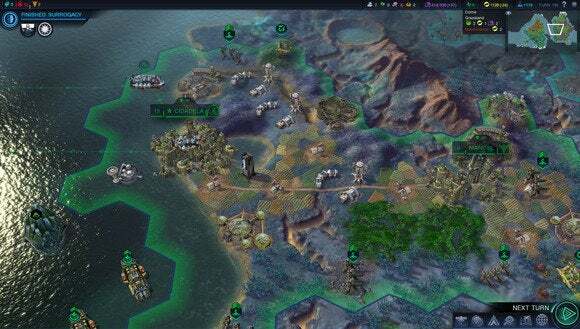 I got my second taste of Civilization: Beyond Earth earlier this week. Before you get excited though, know this—I only got 100 turns. That's double my initial preview's 50 turn maximum, but still a paltry amount of time in terms of any Civilization game. It was basically enough time to start the game, construct a few buildings, research four or five technologies, and then end. I've still experienced very little of the end game's special units, win conditions, or diplomacy. What I have experienced is...well, Civilization V really. But, you know, in space. And you know what? That's still an apropos description. Remember how in ye olden days of games you'd get expansion packs instead of DLC, and those expansion packs were sometimes themed differently than the main game? 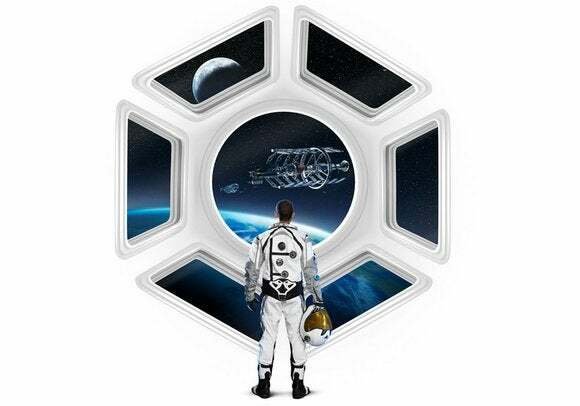 Welcome to Civilization: Beyond Earth. It's like the Far Cry: Blood Dragon to Civilization V's Far Cry 3. I mean that to be neither dismissive nor insulting. 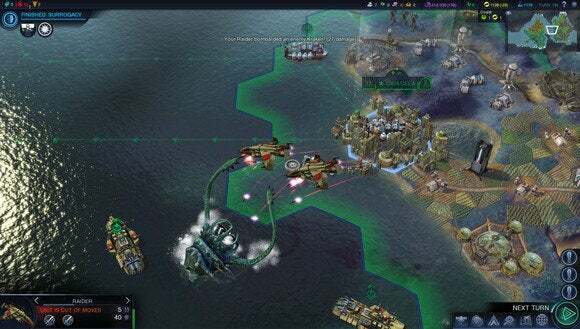 A lot of work has gone into Beyond Earth, and Civilization V is definitely a 4X game worthy of emulation. It just feels a bit like you're playing Civilization V with new unit and resource names, though. Instead of researching archery for early-game ranged units, you'll research physics. Instead of contending with barbarians in the early game, you'll come into conflict with alien mobs. And so on. There are key differences, though. For instance, those alien mobs aren't necessarily hostile. I've had the aliens walk right into my city and yet refrain from attacking—a situation I'm sure made many of my virtual citizens need a fresh set of pants. While they'll sometimes come after you if threatened, you can also (and it's recommended) leave them alone early in the game and eventually research peaceful tactics like the Ultrasonic Fence, which keeps aliens out of your city entirely. 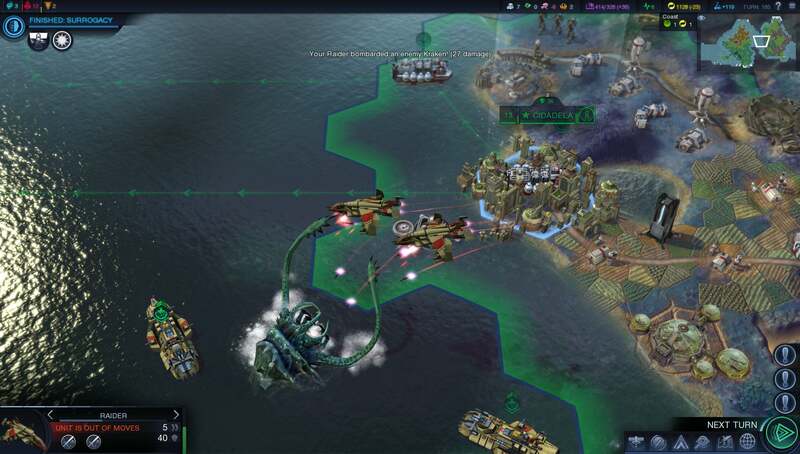 You can still totally blow up giant kraken aliens with fighter jets if you want, though. You'll also see technologies evolve over the course of the game, though the results are only surprising on the first playthrough. After building an Ultrasonic Fence, my scientists eventually returned to tell me they'd made a breakthrough in space-fence-technology. We could either expand the effects of our fence to a three square radius (compared to the original two) or we could attach it to all of our trade convoys so they'd stop being harassed by mobs. And clearly the latter of those two options is better. Trade is huge, here. At the beginning of the game you can choose to start off with the Pioneering technology, or you can research it early on. This allows you to build your trade hub and trade convoys, and the rewards you get are massive. By the 100th turn my two trade convoys were raking in 15 Science and 14 Energy—compared to the 4 Science and 6 Energy coming from my city itself. And yes, I said you can choose that initial technology. Instead of sticking us with a generic starting point, 2K let us play with the game's seeded starts this time around. You're basically setting up a backstory for your colony of space adventurers. Was it a scientific mission? You'll get a boost to your research output. Was it a colony of engineers? Fantastic! You get a boost to production. A trade route in Civilization: Beyond Earth. You can also choose which corporation sponsored your expedition, which is basically equivalent to choosing a civilization. Then each colony receives a gift of some sort—maybe you start off with an extra 100 energy, the aforementioned Pioneering technology, or the ability to spot certain underground resources without scanning. These seem to need more balance, as I even overheard a 2K/Firaxis representative say to another journalist something along the lines of, "You should go for Pioneering or the automatic resource scanning. The other ones are basically worthless." I also got a look at Beyond Earth's maps. There are randomized map types in line with what 4X games traditionally present—one massive landmass, an Earth-like map with multiple oceans, and then a map made mostly of island chains. However I was much more interested in the "Advanced" map options, which are (as far as I can tell) preset. For instance, I played on a map labeled Kepler 186f—"One of the oldest known Earth-like planets, a faint image of the seas and continents of this world inspired the Seeding." Now, in real life we don't know what Kepler 186f is like. There are hypotheses, but nothing solid yet. Still, it's an interesting science fiction-y way for Beyond Earth to cross over with real science. The other Advanced maps do the same, with options to start on Eta Vulpeculae B for instance, or Mu Arae F, which is described as "Tidally locked in orbit around a weak star, the south is blistering desert where the sun never sets while the north is perpetually in frozen darkness." Did these strange seedings make for enormous changes in the game? Not as far as I could tell. But they added somewhat to the allure of those starting moments—a small group of colonists on a foreign planet, trying to stay alive and avoid becoming Roanoke 2.0. The feature I'm most intrigued by, however, is Favors. Early on in a Civilization game diplomacy always seems really stilted. You all greet each other, some make temporary alliances, and some even make agreements to open borders. And then you ignore diplomacy for a while because there's not much worth trading for. Diplomacy still plays a huge part in Civilization: Beyond Earth. 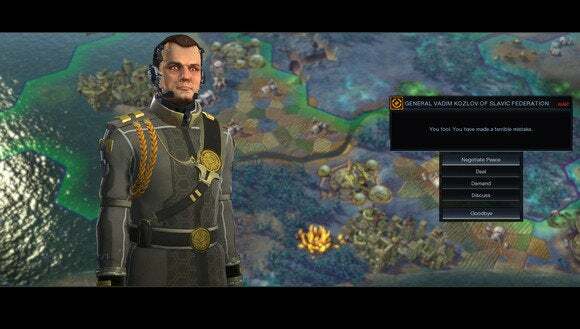 It is a Civ game, after all. 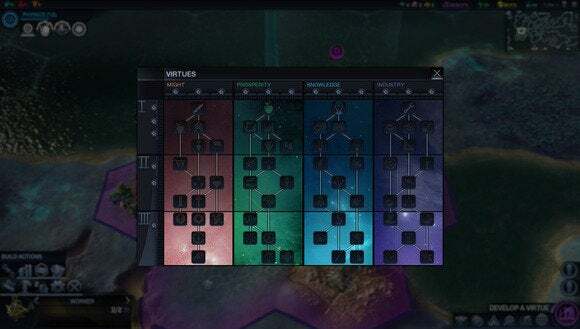 Beyond Earth revamps this with Favors. You can now do a rival corporation a solid early in the game, and then call that favor in later. I had a corporation ask me for 100 Energy (used to outright buy buildings and units) in return for a Favor, which I accepted. That Favor then becomes a form of currency, used for my own diplomacy dealings later. I don't know how Favors scale over the centuries—can I use that early Favor to ask for a high-end technology later?—but it's probably my favorite addition to Beyond Earth so far. 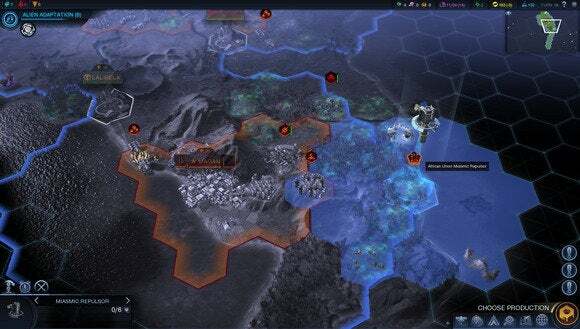 Beyond Earth is Civilization V in space. It's a successor to Alpha Centauri. It's a dozen different, reductive things. But at the end of the day it also looks like a great 4X game in its own right. We'll know for sure when the game launches (get it?) in October.